The New York Daily News, champion of working people, has just run yet another editorial demanding that ATR teachers be fired. The best way to improve things in Fun City, evidently, is to put 2,000 more people out of work. Perhaps that could be the next campaign slogan for the city's richest man, who bought Gracie Mansion fair and square and then changed the law to do it again. No fault is assigned to principals who take all sorts of cute shortcuts to avoid hiring veteran teachers. When they pursue their selfish and narrow agendas, that's perfectly fine. But oh those teachers. How dare they desire jobs! Let them wander the streets like all the other bums. Covering classes for absent colleagues, according to the Daily News, is tantamount to doing nothing. And the idea of actually putting these teachers to work, apparently, is too radical for Daily News editorial writers. You'd think Mayor Mike, whose actual TV campaign theme revolves around putting people to work, would want to put them to work too. You'd be mistaken. One failed reform after another says these teachers are too useful as scapegoats. 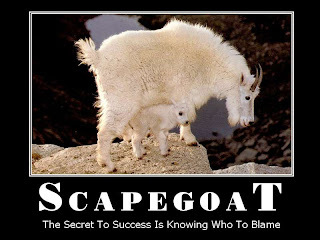 And every demagogue needs a good scapegoat.